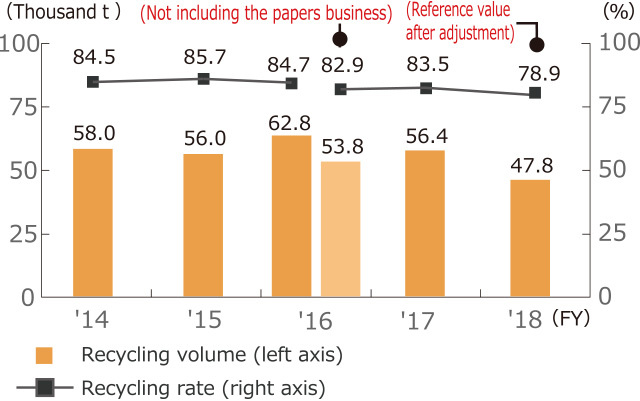 The volume of waste generated by the Nisshinbo Group was 67.6 thousand tons, down 9% year on year due to the transfer of the Group’s papers business. 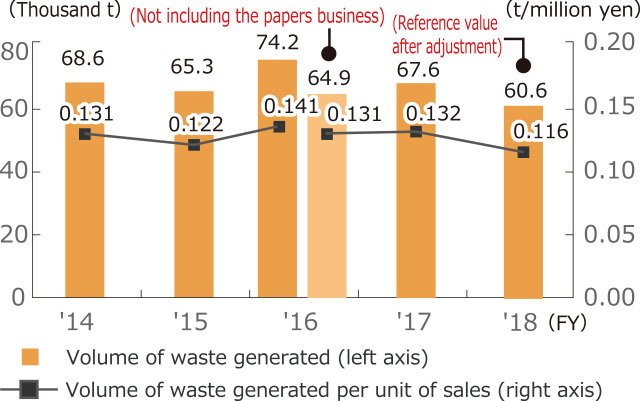 The volume of waste generated per unit of sales also dropped 6% to 0.132 tons per million yen. Excluding the papers business, the volume of waste generated rose 4% year on year along with a slight rise in volume of waste per unit of sales. The Group’s recycling rate was 83.5%, up 0.6% year on year. Throughout the Group, we are working toward zero emissions (a recycling ratio of 99% or more). Out of our locations that generated 10 or more tons of waste in fiscal 2017, 20 locations achieved zero emissions, up from 18 in fiscal 2016. The Nisshinbo Group has set the target of achieving a 95% recycling rate by fiscal 2025. To this end, we are engaging in initiatives to reduce the amount of waste generated by each business. * This drop in recycling rate for the chemicals business is due to routine repairs at the Company’s recycling and disposal contractor.